Plotting a map brings about two issues: colors and scale, as they both have to work together to best describe your data or else failure is on the line. To have a better perception of how colors look on a map, I find very useful this website Color Brewer by Cindy Brewer (read a recent interview here), which gives advice on map colors, hues and scales for various backgrounds and contexts. Purple: color of mourning in Thailand. 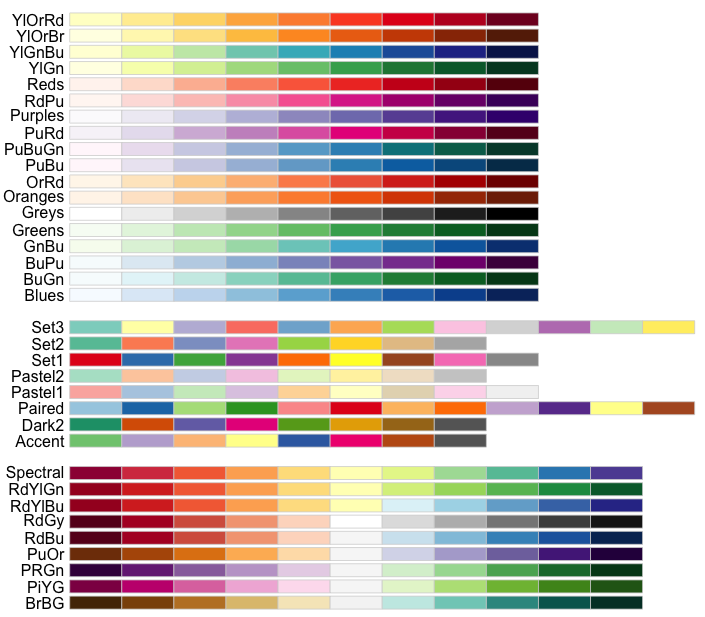 for further information see this comprehensive graph of colors in culture. A good rule is also not to choose colors in order to give a good/bad message (green vs red or blue vs red), unless you are mapping the number of drowned kittens. Once solved the color issue, which I’d like to stress should be weighted together with the choice of a specific palette, we can choose a number of class intervals, that is to say how many colors we are going to use. If I use a diverging palette for continuous variables, I prefer to have an odd number of colors, either 5 or 7 (but this fits my specific mapping requirements), so that the mid value has neutral light tones. Also, ideally breaks should mean something and not be arbitrarily chosen. R once again has a solution for this, the classInt library, which provides a set of styles to choose from for continuous numerical variables (sd, equal, pretty, quantile, kmeans, hclust, bclust, fisher, or jenks), as well as the option to set them manually (fixed). n <- 5 # how many colors? Previous Previous post: A space-time box plot of Spain’s TFR for 910 comarcas.